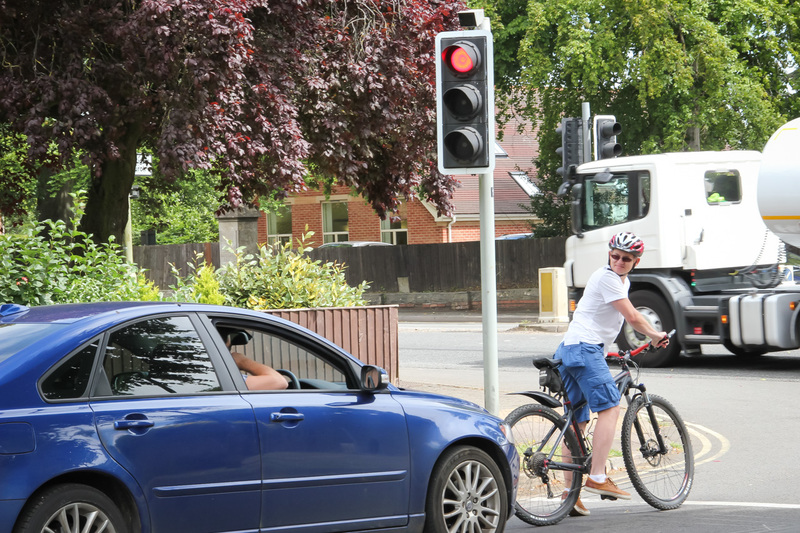 Sharing the road with other users isn’t always straightforward – there can be times where manoeuvres that could be very simple become more complicated than they need to be. However, this is often the case when there is little communication between two individuals trying to work together in a small space. 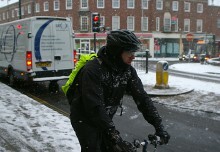 Issues with traffic and other road users can put people off cycling, but there really is no need. It’s rare that a driver ever wants to hurt a cyclist, and vice versa – a little communication can go a long way to helping diffuse potentially difficult situations, and prevent accidents. Eye contact is one of the most valuable tools at your disposal. 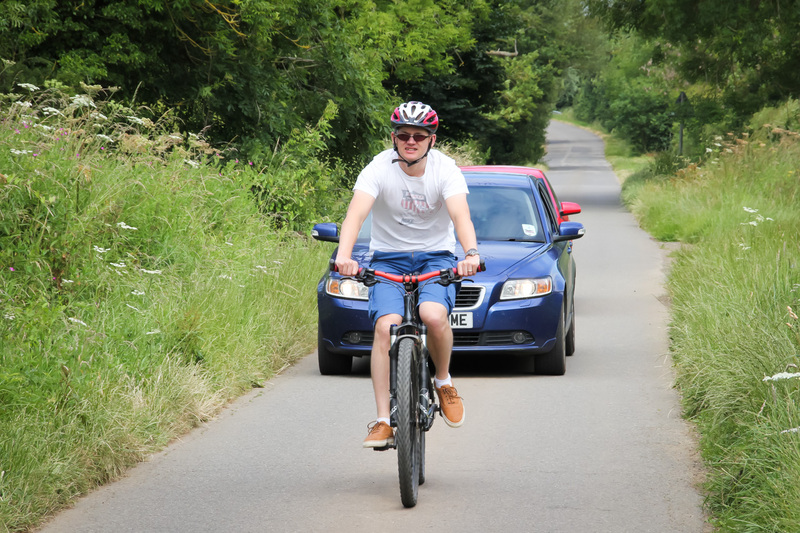 Firstly, in cases where another road user is becoming antagonistic, a simple but purposeful glance, and a smile, can remind them that you are human. 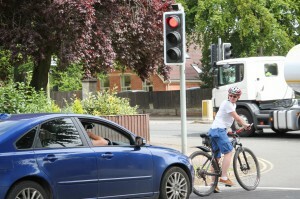 When stopped at traffic lights, it is also a good idea to make direct eye contact, smile and nod at drivers. If they return the eye contact, they will often reciprocate with a friendly greeting, and this generally means they will act with your presence in mind when moving off. If you spot a driver who is not concentrating and looking forwards, perhaps texting or operating a SatNav, you will know to be wary of them. Looking around before making a manoeuvre is essential. 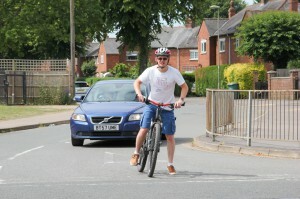 Firstly, you’ll need to assess the road. 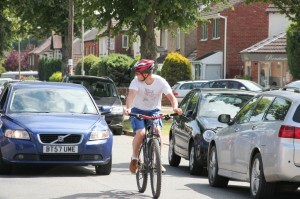 Secondly, it will alert those sharing the road with you that you are about to deviate from your previous straight line. 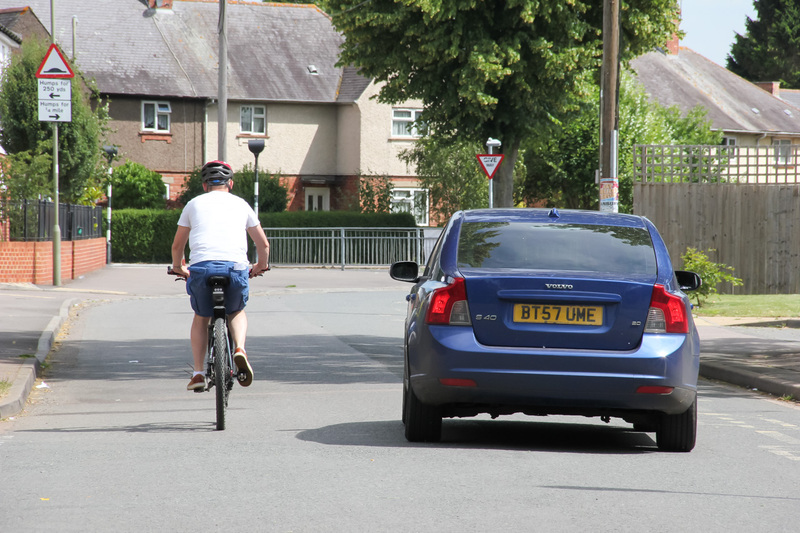 For example, before moving out to overtake another cyclist or parked car, make a conscious effort to look behind and to the left – theatrically, if you need to. 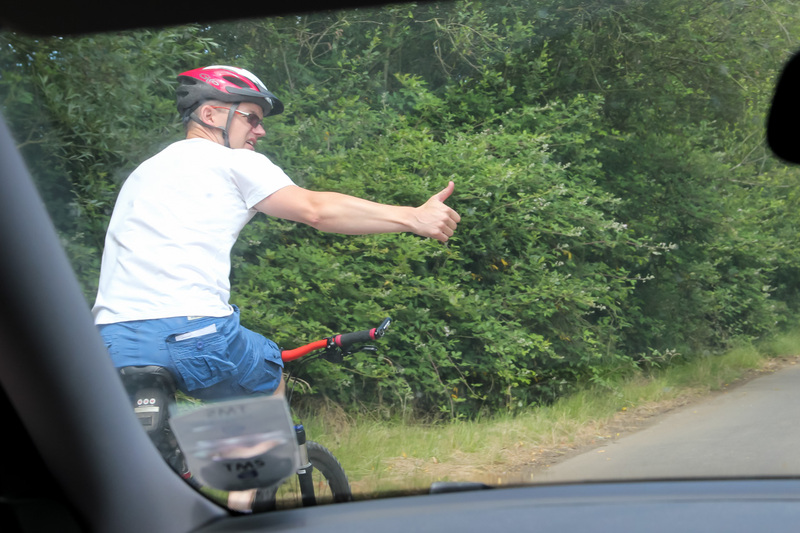 When another road user shows kindness to you – giving you right of way or patiently waiting behind you for an extended period of time – make sure to wave and say thank you. 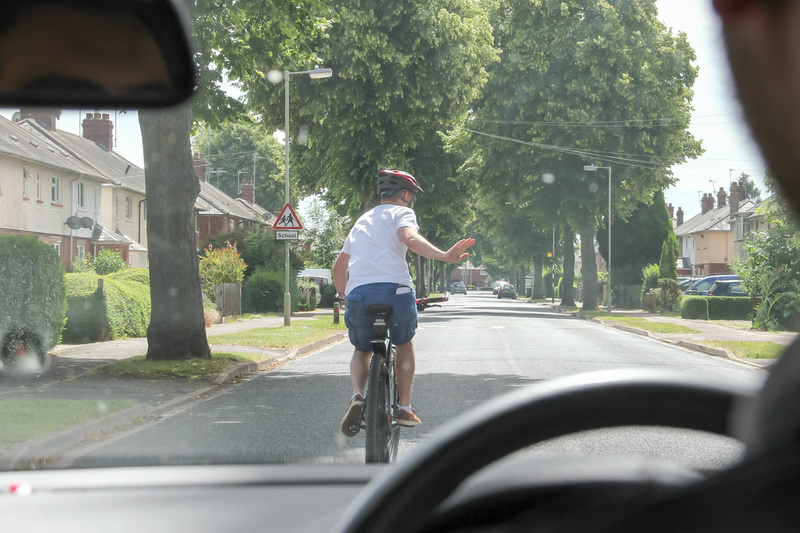 In the same manner, don’t be afraid to make it clear if a driver cuts you up, or passes too close – they may not have been aware, and could need reminding what is acceptable. 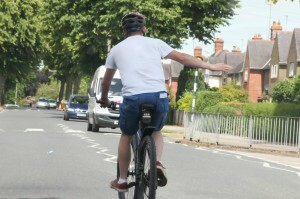 The relationship between cyclists and drivers hasn’t always been great – we need to show our appreciation when they act graciously, and stand up for ourselves when they don’t – otherwise we risk alienating the good ones, and allowing the bad ones to continue. Drivers quite often naturally give you the same amount of distance when passing, as you give yourself from the curb. This isn’t an absolute rule, but studies have suggested it is a typical reaction. If you ride very close the curb, you are likely to reduce the amount of room you are given. Not only that, but you give yourself very little room for movement should you need to swerve to avoid a pot hole or another obstacle. Obviously, we wouldn’t suggest you ride in the middle of the road, as this can appear antagonistic unless you are moving at the same speed as the rest of the traffic. However, give yourself at least a few feet. When riding on a country lane where there is not space for a driver to overtake, or when approaching a blind bend where you know they cannot see around the corner, it can be a good idea to move further into the lane to ensure that they are aware you will not be squeezed around. Once there is room for the driver to come past, moving back to the left and waving them through is a friendly gesture that shows you had their best interests in mind. It’s also important to make it clear what your next intentions are, and you can do this with road positioning. For example, make sure you are in the correct lane at a roundabout so it is clear to drivers what your next movements will be. 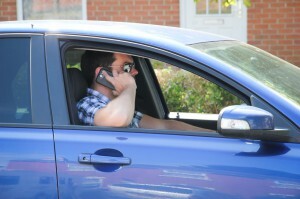 You can also communicate with drivers by taking a confident position on the road when approaching a junction. If you arrive at a junction at the left hand side, they may take this to mean you expect them to turn left before you, or perhaps since you are not directly in front of them, they won’t even consider your next movement. 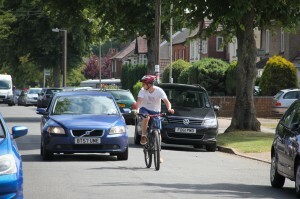 Instead, take the middle of the road at junctions – making it clear that you are in line with the traffic and you will take your turn when it comes. This seems a fairly obvious addition – but do make sure you know how to indicate left and right, and that you are fully capable of doing so in all but the most exceptional cases. 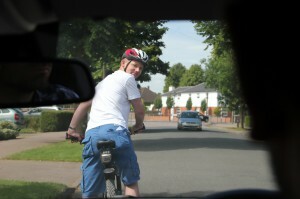 You should be able to look directly behind you, whilst lifting a hand off the handlebar before you ride on the road. 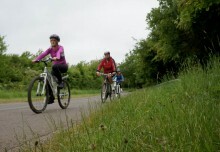 If this isn’t something you can do yet, it’s best to look for a cycle training course where you can have an instructor help you with the techniques needed. You can also take some time to practice in a traffic free area – a good test is to ask someone to stand behind you, holding up 1-5 fingers. You should be able to look over your shoulder, and then raise a hand to replicate the number of fingers held up. Test yourself, and if you can’t do it – practice. Indicating isn’t just about waving left and right. Other forms could include looking behind you, and then moving further out into the road when turning right, or bending your right knee out noticeable to make it clear you are preparing to corner right. Of course, none of the above will be at all effective if you are not seen. 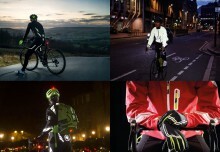 Though not always considered incredibly fashionable, high viz clothing will increase driver’s awareness of you, and of course lights are a must when light is low or visibility is poor. 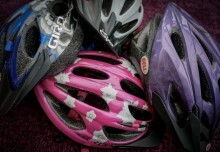 Riding on the road can appear daunting, but making sure your intentions are both known, and taken into account, is a good way of drastically reducing any risk factors.